13th January 2019 at 10am. All places have sold , thanks for your great support and commiserations if you missed out on a place. We now look forward to hosting a great race in January. Brass Monkey Page for race details. Race licence no : 2019-36562. Transfers will be allowed (see this page for details on how to do a transfer) up to 23:59 on December 21st 2018. After this time no further transfers will be allowed unless sanctioned directly by the organisers. Please note that all runners must be 18 or older on the day of the race. * Please note that your British Athletics/UKA membership will be checked during the registration process and if valid the appropriate discount will be applied. Scottish Athletics and Welsh Athletics members can also obtain the discount by entering their membership number into the appropriate field in the approved format. There will be no registrations on the day. The weather in January can be unpredictable. York Knavesmire Harriers take safety very seriously and are out with our gritters in the week leading upto the event and on event day itself. If the hard decision is made to cancel the event we will post this on our website and our Facebook pages. Unfortunately we are not in the position to offer refunds or transfers. All race mementos will be available for all runners to collect. For logistical reasons there is a 2h:45m cut off time for completing the course. Entries can not be deferred from one year to the next . Transfer of places has to be done via the ‘official’ method and before the deadline. Follow the Brass Monkey Half Marathon Facebook page for the latest news/updates. The race is based at York Racecourse and we once again have use of the Ebor Stand for the provision of hot & cold drinks*, light refreshments*, toilets, baggage storage and limited changing facilities. (*subject to small a charge). The route is fast and flat, heading southwards through Bishopthorpe, Acaster Selby, Appleton Roebuck and back through Bishopthorpe to finish behind the Racecourse grandstands. 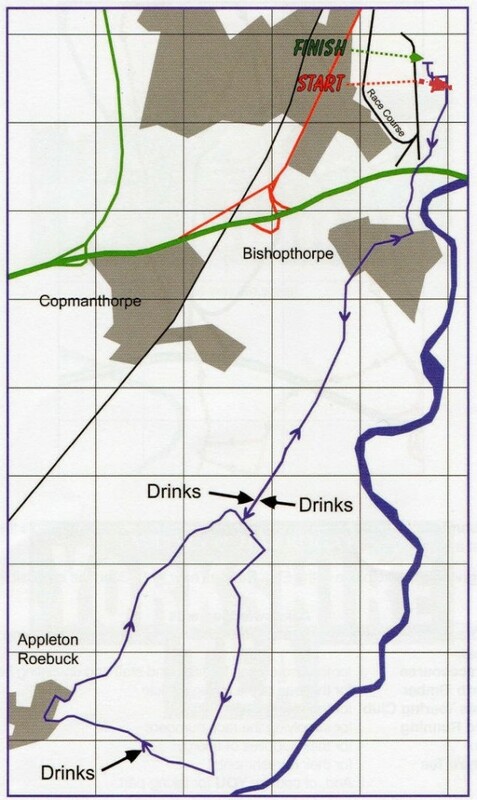 The course is on public roads , Bishopthorpe Road will only be closed from the start to Bishopthorpe Palace, all other roads will be open to traffic, so please follow the pre race instructions and those of the marshals. Limited free parking is available. Please follow signs and directions. * If either winners of the open category breaks the course record, an additional £150 will be awarded to that runner. UKAthletics Road Race Licence has been applied for, the course is certified accurate by the Assoc’ of UK Course Measurers, and we have UK Athletics BARR Gold Grade.